With such significance of Agriculture in employment creation, a question of proportions begs. 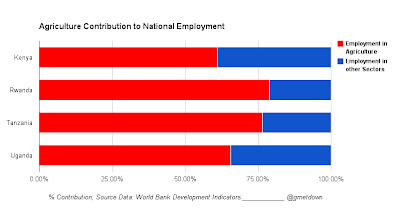 That is the question of why the many jobs attributable to agriculture do not result in a commensurate contribution to national GDP growth by the sector in East Africa. Everyone is capable of a radical mind shift at some point in their short lives. Health IT, eHealth and mHealth have been my favorite ICT4D areas for over half a decade. In 2013, I found myself shifting interests away from health towards agriculture. For avoidance of doubt, health is a great field to achieve results at a personal level, institutional level or otherwise. I wrote much about eHealth or related topic here in the "yester-years". In East Africa, the health sector has employed many brilliant minds especially in NGOs and government - from health care workers to health systems practitioners. Opportunities for innovation, entrepreneurship and even job careers in health continue to knock at doors of the region's talented workforce. 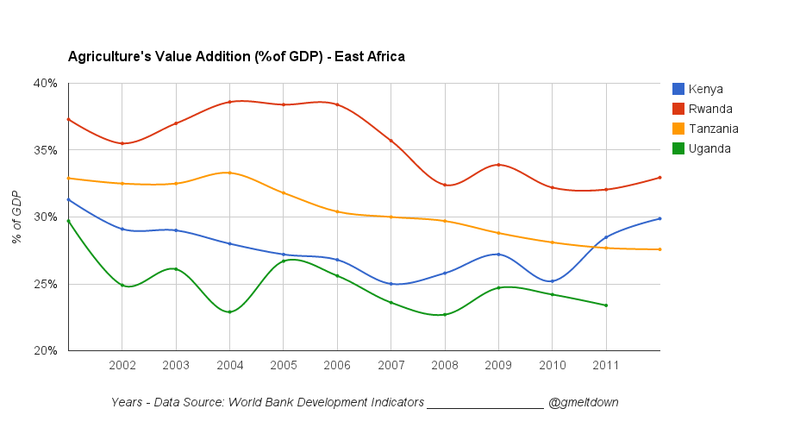 However this article in the East African based on a report titled "Investments to End Poverty" by Development Initiative's (DI) does much to present an alternative view which is validating my shifting focus. According to DI's report, "East Africa received nearly $9 billion of aid in 2011, with the biggest chunk channeled to the health sector". This according to the report is disproportionate to the real needs expressed by people in developing countries. The report suggests, “On the other hand, there are few political champions for those issues that top the list of citizens’ priorities in sub-Saharan Africa or Latin America, such as jobs/income, security or infrastructure.” Furthermore, a World Bank Development Report in 2008 indicated that among developing countries, 1 percent GDP growth originating in agriculture potentially reduces poverty by at least 2.5 times as much as the same GDP growth originating in the rest of the economy. Job creation and income generation for poverty eradication are the reasons I am betting big on mobiles for agriculture (mAgric) in 2014. It could be either mAgri or mAgric am referring to, or both. To me they both refer to the application of mobile technologies to help increase efficiency and productivity in agricultural value chains.There is the mAgri program of the GSM Association (GSMA) that makes generic use of the term mAgri difficult. To avoid confusing the GSMA program and the emerging discipline around mobiles for agriculture, I shall stick to mAgric as my reference abbreviation. Needless to say, mobile phones have become ubiquitous computers and communication devices in most developing countries. Mobile technology therefore appears top on the list before any other technology for fostering development in East Africa. This is already demonstrated in the area of financial inclusion. I have had my own observations, rants and raves on this in previous articles here. Ostensibly then, not much effort should be spent explaining the narrowing act of embracing mobile technology in development and not all information and communication technology in general. Agriculture is complex; Why mAgric anyway? 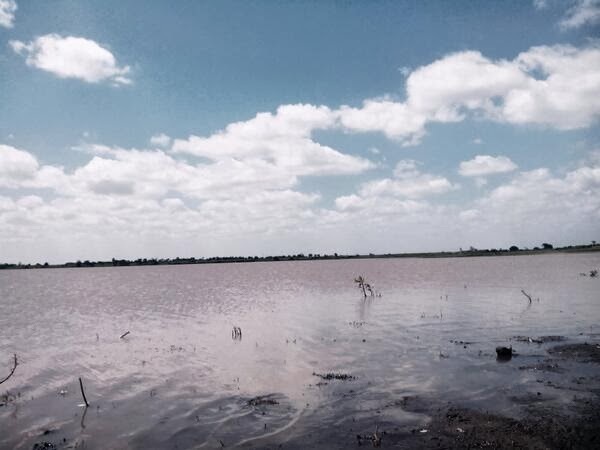 It should not be easy to convince everyone that advancements in mAgric innovation will single handedly solve the matter of sub-optimal productivity in East Africa's agricultural sector. I shall argue though, that innovations and entrepreneurship in mAgric can play a big role in revitalizing and optimizing activities in agricultural value chains. In his book "The New Harvest - Agricultural Innovation in Africa", Calestous Juma, a renown professor of innovation and sustainable development argues that "Agriculture needs to be viewed as a knowledge-based entrepreneurial activity". It is access to information and transactional efficiencies for value chain actors possible through mobile applications that I would bet on in mAgric. Such applications are bound to enhance the knowledge-based entrepreneurial activities that Prof. Juma refers to. Arguably, for developing nations serious about uplifting agricultural productivity, the role of mAgric in revitalizing agricultural practice is big. This is validated by the notion that for national economies to grow sustainably, deliberate premium has to be placed on a learning culture and improved problem solving skills in the productive population. These can be fostered through promotion and use of appropriate mobile applications in the case of agriculture. 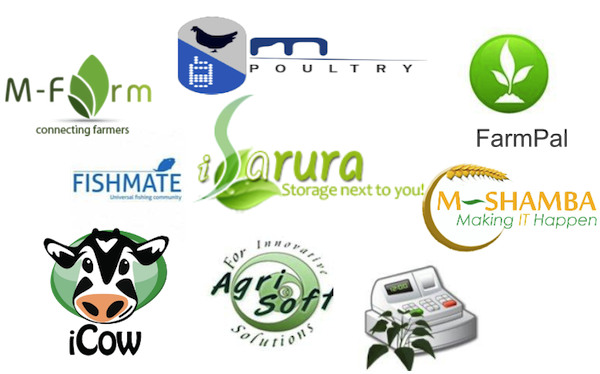 Many mAgric applications including Mfarm, iCow, eSoko, and M-shamba have been introduced to East Africa's agriculture actors over the last three years. Although it would seem obvious that uptake of such innovations will be rapid in East Africa, that has not been the case. m:lab East Africa has since 2012 organized a series of focus group discussions dubbed "Wireless Wednesday" that have highlighted issues bedeviling mAgric and the opportunities in the region. A recap of one such meet-up held in October 2013 highlights many issues including awareness and ease of use. Observations made in April 2012, are similar to those made in the more recent meet-ups and this beg the question of whether progress is being made. A video clip taken of Qureish Noordin (pardon the quality) from AGRA elaborating concerns from enablers' perspective below may help to demonstrate the complexity of issues affecting uptake of mAgric innovations in East Africa. More efforts continue to be made to attract more innovations in the ICT for agriculture (ICT4ag)space. This is exemplified in CTA's ICT4ag competition in 2013 among other similarly themed contests targeting innovators in developing nations. The emerging concern among actors and enablers in the mAgric space is therefore whether any of the new or existing innovations can amass significant uptake for meaningful impact in the agricultural sector to be realized while achieving sustainability. 2013 had its own highlights and disappointments. One major highlight for me was a win against procrastination, whereby I got to register for long overdue doctoral studies. It is the apparent slow uptake, and sustainability challenges of mAgric applications that I shall be investigating in my PhD thesis throughout 2013 and beyond. 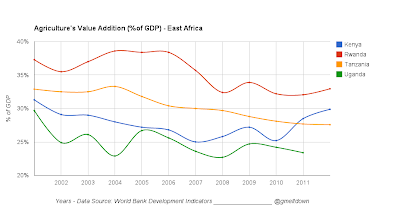 That may explain the increased analysis and "opinionation" about mAgric applications, and the promise for agricultural prosperity throughout East Africa in this blog as 2013 comes along. For now I shall leave you with another video clip (pardon the quality) taken of Safaricom's Peter Gichangi sharing his thoughts with developers at a Wireless Wednesday meet-up addressing the challenges for uptake of mAgric applications. I am not an expert on mAgric, but for sure any innovation in the agriculture sector would be a definite plus for the farmer, thus extending the benefit to the wider Kenyan community. Owing to 30% earner of the country's GDP, agriculture needs to be in the forefront of innovation.